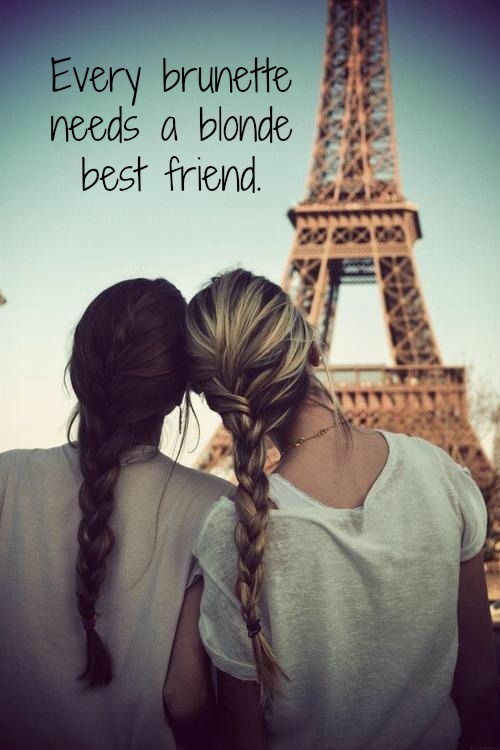 Every brunette needs a blonde best friend. This is a picture of two girls staring at the Eiffel tower with French braids. Blonde haired girl and brunette haired girl sitting side by side. Memorialize your best friend quotes on PicMonkey. Use the PicMonkey photo editor to create your own meme with different filters, effects and collage. Create a meme just like this one with vignette, photo filter and several fonts to choose from. Learn more about PicMonkey by visiting our editor. Touchup your photos, create a collage, edit a photo and more.